Android Marshmallow 6.0 has been available for over two months, but it looks like the new platform update is struggling to gain any meaningful market share, according to distribution numbers released by Google this month. 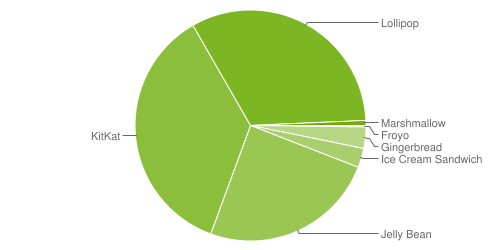 The new platform update holds a measly 0.7-percent share, meaning Gingerbread 2.3 and Ice Cream Sandwich 4.0 each have four times as many users as Marshmallow. The only supported platform with less market share is Froyo 2.2, with 0.2 percent. The big three distribution leaders are Jelly Bean, KitKat, and Lollipop. All three versions of Jelly Bean together hold a 24.7 percent market share, with Jelly Bean 4.2 the most popular of the three versions at 12.2 percent. Lollipop comes in second in the market-share sweepstakes with a 32.4 percent share split between 5.0 and 5.1. Each version has a similar number of users — so it seems some Lollipop phones are being updated to 5.1, instead of getting the big push to Marshmallow. The big winner in January is KitKat 4.4, with 36.1 percent of all Android phones using this version of Android. KitKat launched in 2013, meaning some of the phones launched early with this platform might not ever see an update to Lollipop or Marshmallow. That might be problematic for Google, which doesn’t want another Gingerbread scenario. Unlike iOS, Google is incapable of forcing updates to third-party devices, naturally leading to some fragmentation across the platform. Google is tightening its grip on Android, and we wouldn’t be surprised to see the company ask third-party manufacturers to update smartphones at least every 12 or 18 months. The firm has already launched the Nexus and Google Play edition to try and show what it wants from partners — so it may only be a matter of time before it becomes more involved, especially with these distribution numbers. BMW wants to replace mirrors with cameras ... will the government allow the change?